Overview on Endolumenal Therapy and N.o.t.e.s. in Obesity and Metabolic Disease Treatment. What Will Be the Future? Background: Intragastric balloon has been used in obese patients as a restrictive gastric procedure inducing early satiety and weight loss. This prospective study assesses both the safety and effectiveness of intragastric Balloon (BIB®) in the treatment of obese patients. 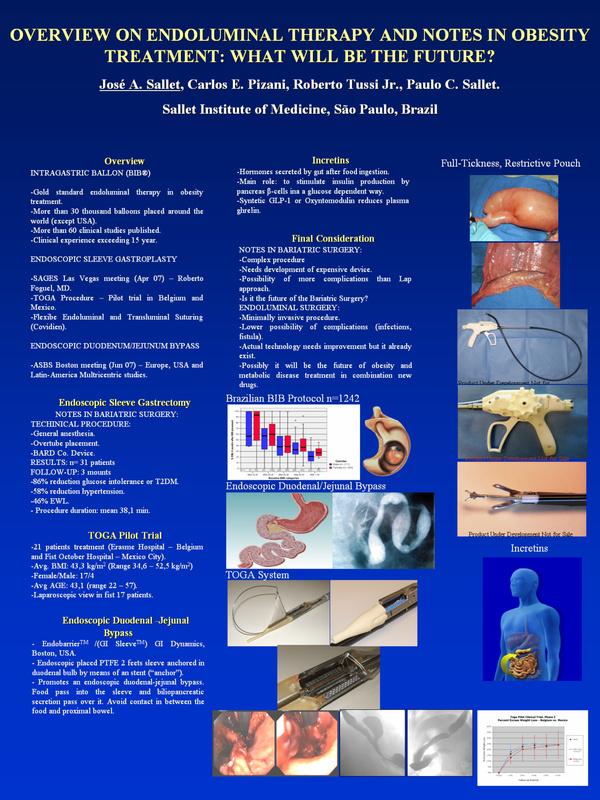 Endoscopic Sleeve Gastroplasty was showed at SAGES Las Vegas Meeting by Roberto Fogel (apr/07). Endoscopic Duodenum-Jejunum By-Pass was introduced at ASBS Boston Meeting (jun/07) by Europe – USA – Latin American Multicentric Study. Method: From November 2000 to March 2007, after Brazilian Ministry of Health’s approval of BIB protocol 1492 overweight and obese pacients were treated with the intragastric balloon. 1242 of them completed a 6-mounth follow-up: 410 male (BMI = 42.8±10.7 Kg/m2) and 832 female patients (BMI = 35.5±7.8 Kg/ m2) mean (BMI = 38.5±9.8 Kg/m2). All patients were encouraged to take part in a multidisciplinary program involving clinical, psychiatric, physical training and dietary approaches. Endoscopic Sleeve Gartroplasty n= 31, with 3 months follow-up. Endoscopic Obesity Treatment in Chile, Netherlands and USA with 12 patients (7 female) BIM = 43. Results: After a 6-mouth follow-up subjects showed significant reductions in percent excess weight (%EWL = 44.8±30.5%) and percent of total weight loss (%TWL = 12.5±6.7%). The main side effects were nausea/vomiting (521 cases, 42%), epigastric pain (260 cases, 21%), requiring prothesis removal in 25 patients (2,01%). Endoscopic Sleeve Gastroplasty 3 months follow-up showed: 86% reduction glucose intolerance, 58% reduction hypertension and 46% reduction EWL. Endoscopic Obesity Treatment showed mean percent excess weight loss = 24%. Conclusion: The intragastric balloon (BIB®) is effective to temporarily control obesity. It is not associated with mortality and shows minimal risk of major complications. N.O.T.E.S in Bariatric Surgery are complex, needs development of expansive devices, possibility of more complications than laparoscopic approach. What will be the Future: the production by pharmaceutical industry of Hormones secretet by Gut like Syntetic GLP-1 and Oxyntomodulin associate with a endolumenal therapy will be the future for treatment of obesity and metabolic disease.